This leaflet was handed out at the recently held Chicago Football Classic on Saturday. In fact they had children hand these leaflets out before game where two HBCU (Historically Black College/University) football teams Mississippi Valley State University had defeated Alabama State University 10-3 at Soldier Field. Of course this wasn't the only political activity there on that day as Congressman Danny Davis, Circuit Court Clerk Dorothy Brown, and a woman named Kari K. Steele (from Chicago's Sixth Ward) were seeking petition signatures respective for County Board President and Commissioner on the Water Reclamation District. 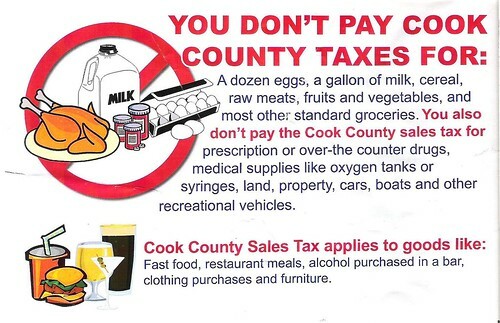 Anyway, here's the flier explaining the purpose of the Cook County sales tax it doesn't seem to advocate for a reduction of it. 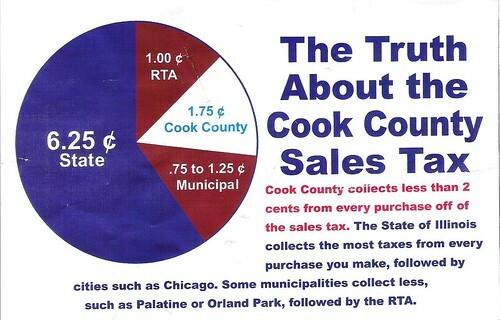 In fact it seems to want to qwell some of the bellyaching over the fact that Cook County has the highest sales tax in the county. 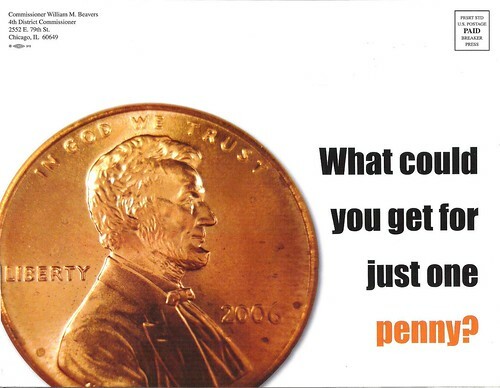 I want to present here another flier from Bill Beavers asking us if his constituents are willing to pay an extra penny in sales tax. I got this in the mail over the summer. Posted about it on The Sixth Ward. Well both of these pieces have an agenda one was more informative, perhaps even to quell bellyaching over the county sales tax. The other agenda was to maintain the healthcare services in the county. The next question is to ask if you think these pieces were effective? See, Beaver's flier gets right to the point. "Do you want services to continue?" "Yes or no?" 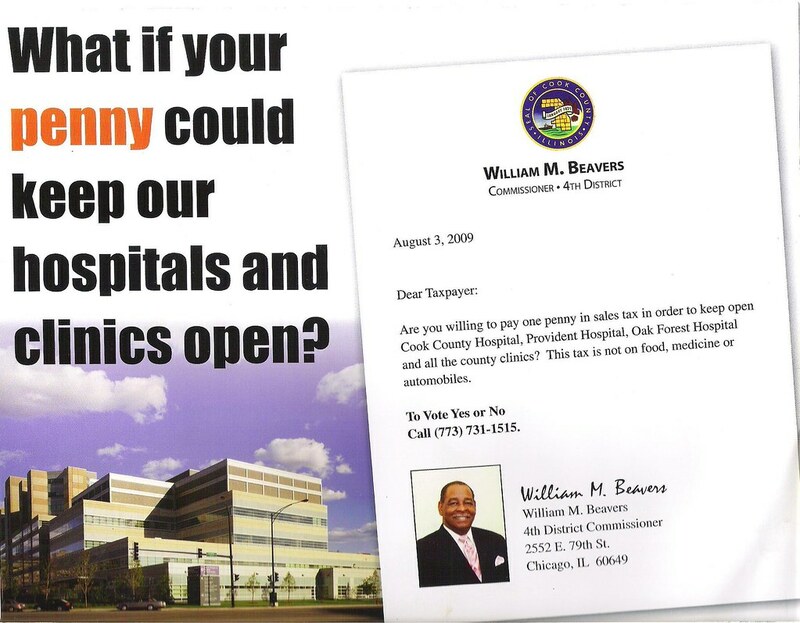 Warren Batts, the Chairman of the Cook County Health and Hospitals System said facilities will close, not just a reduction in workforce, if we lose that revenue.